Beginning from centuries of anecdotal descriptions of cell death, such as those on the development of the midwife toad in 1842 by Carl Vogt, to modern-day investigations of cell death as a biological discipline, it has become accepted that cell death in multicellular organisms is a normal part of life. This book provides a comprehensive view of cell death, from its mechanisms of initiation and execution, to its implication in human disease and therapy. 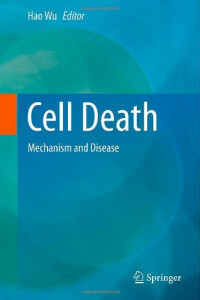 Physiological cell death plays critical roles in almost all aspects of biology, and the book details its roles in lymphocyte homeostasis, neuronal function, metabolism, and the DNA damage response. When physiological cell death goes awry, diseases can arise, and cancer is presented as a central paradigm for the consequences of derangements in the interplay between cell survival and cell death. At the same time, the potential promise of targeted therapies aimed at interdicting cell death machineries are also discussed extensively. The molecular mechanisms that underlie apoptotic cell death are illustrated from the perspectives of both the intrinsic, mitochondrial apoptotic pathway and the extrinsic, death receptor pathway. Key players in these pathways, such as the Bcl2 family proteins, cytochrome c, Apaf-1, caspases, death receptor adapter proteins, and inhibitor of apoptosis proteins, are presented from both functional and structural angles. Until only a few years ago, programmed cell death has been considered essentially synonymous with apoptosis. However, we now know that programmed cell death can also take other forms such as necrosis or necroptosis, and to this end, the mechanisms that underlie programmed necrosis in development and host defense are illustrated. The past twenty plus years have seen an incredible growth of research in cell death, with one breakthrough after another, and the legacy still goes on with constant new surprises and findings. Long live cell death!